Six Sigma Certification is a valuable business asset which serves as a tool to help you and your workforce optimize your supply chain and other business processes. Six Sigma training is involved and intense and demands a high level of rigor and commitment. It also typically costs money to complete. Some companies will provide Six Sigma training to their employees, so if you're looking for free Six Sigma training, start by checking with your employer. Next, try the American Society for Quality. They can point you to all things legitimate in the Six Sigma world. Also, the Six Sigma Digest can provide learning resources, including free ones. And for the very basics of Six Sigma, you can check out the Aveta Business Institute's free white belt training. For a self-study option that offers free materials and information on how to get certified, check The Council for Six Sigma Certification. Motorola implemented the concept of Six Sigma in the mid-1980s as a way to seek process improvements in its manufacturing operations. Since then, the term has become synonymous with process optimization. In a nutshell, Six Sigma projects are disciplined, data-driven and designed to improve processes by identifying and removing the causes of defects or errors and minimizing variability. Six Sigma projects are usually led by professionals trained (and typically certified) in Six Sigma techniques. The Six Sigma vocabulary can sometimes be confusing, so here’s an overview to get you started. Understanding these terms will help you as you look through free course offerings so that you'll have a better idea of what these courses are really offering you. 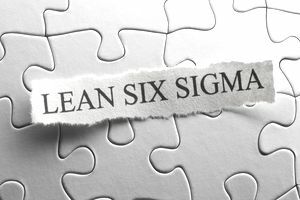 The term Six Sigma comes from the statistical principle that states: If you start at your process’ mean value and eliminate defects within six standard deviations of the mean and the nearest specification limit, you’ll virtually eliminate all defects or errors. If you’re not a statistician, think of Six Sigma as looking at a bell curve and eliminating the errors within the thick chunk of the bell. Within any Six Sigma project, you’ll want and need executive leadership. This role can include the CEO or other top management. They are responsible for setting up a vision for a Six Sigma implementation. One important aspect of having executive leadership is the buy-in aspect of it from the employees involved. If you want a project to succeed, it’s critical that those in an organization understand why it’s important, and to whom it’s important. The Champion is the person in an organization who 'champions' a Six Sigma project, like a senior manager who ensures that it’s properly resourced and uses their authority to overcome organizational barriers. The champion sits a level below the Executive Leadership. The Master Black Belt is an expert with extensive experience and technical expertise in all aspects of Six Sigma. The Master Black Belt has responsibility for selecting, training and mentoring black belts within an organization. They’ll also ensure the Six Sigma program standards are maintained. A Black Belt is a full-time professional and team leader responsible for the operation and outcome of a Six Sigma project. Black Belt training courses involve a month or more of classroom training — with a study focus on methods, statistical tools, and team skills. Black Belt training courses also require a completed Six Sigma project. Certified Six Sigma Black Belt qualification courses are offered by the American Society for Quality (ASQ) and other organizations. A Green Belt has been trained in Six Sigma methodology and participates in projects as part of their full-time job. They may either work as part of a team, led by a Black Belt, or lead smaller projects, with a Black Belt acting as a mentor. The Project Sponsor is a manager who can sign off on resources, defines objectives and evaluates outcomes. The Project Sponsor is sometimes the Champion or Executive Leadership. The high-level objective that a Six Sigma project seeks to improve is known as the Big Y . The Big Y is often used to generate little y operational objectives that need to be improved to hit the Big Y target. While you've probably heard the saying that "there's no such thing as a free lunch," if you have the interest and diligence to engage in self-study, you might be able to leverage free Six Sigma materials into a new chapter in your career and future. What Are Supply Chain Performance Metrics?